As far as I know from the responses I've seen / received (and that I can remember), nobody was asking why Diane didn't suspect Nanase when Diane actually had at least some reason to at least consider her as a suspect. I'm going to assume some of you were wondering regardless, however, and now those hypothetical individuals have their answer. Huzzah! Diane's opinion of Nanase has been known to me for a looooooong time. 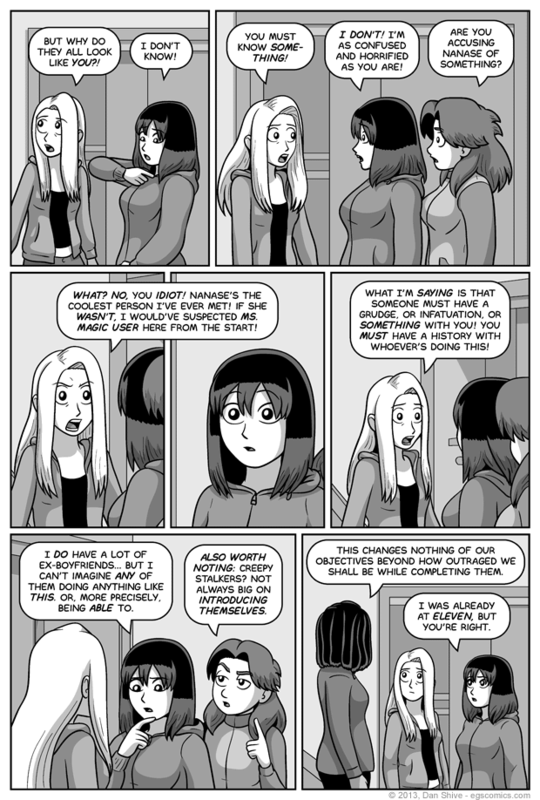 I'm not 100% sure how long, but Diane's look of hurt after being called a "pest" by Nanase in a comic from 2007 was intentional foreshadowing. And yes, Charlotte has changed her outfit. Or, more accurately, she's ditched the robe and replaced it with another layer of clothing. Given that it's snowing, it's safe to say that it's literally freezing outside. She wasn't going to go out there in shorts and a tank top.